After Challenge Almere I was not done yet with triathlons this year. I wanted to finish this year in a kind of good way. So I choose to do Ironman Arizona, because I had good memories of this race and the preparation time between Almere and Arizona was acceptable, 9 weeks. As preparation I went to Lanzarote for 2 and half weeks. Training went well and my running was getting better and better. I had a great stay at Daz' and Debs' Trisports Lanzarote. I would recommend this overwhelming villa to everyone who is looking for a nice, relaxed and awesome place for training. A week before the race I travelled together with my mom and aunt to the States. After 20 hours we finally arrived in our cosy condo in Mesa. I used the first days to get rid of my jetlag and loosen up my body with some easy training. From day one, I felt at ease in this nice climat. 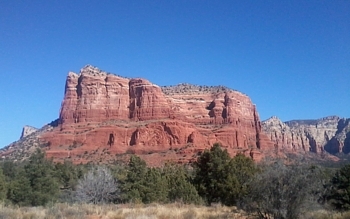 I really like the desert of Arizona in this part of the year. I was ready to smash it for one more time this year. So on Sunday November 17th around 6h45 in the morning we entered the water. It was a little chilly, but not too bad. 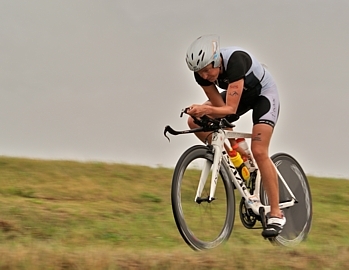 I had a decent swim, not very special, and entered the bike course in 27th position. In the beginning I had to push the bike really hard, but half way I found my rythm. I was overtaking a lot of girls and after 120 km I was riding in 15th position with 5 girls within a few minutes in front of me. Moving towards my race goal. But then the disaster happened. A sudden big "BANG"! My front tyre, flat! It took me a little to change it and I lost almost 15 minutes. So the chance to finish top 8 was over! But I was still focused to bike a sub 5 hour (without stop). And so I did, you will find a 5.09 in the official results, but my Garmin told me that I biked 4 hours and 55 minutes. Personal best on this course, not bad! And then the run. The lack of run training this year due to my injury is still following me, I made only 50% of the kilometers compared to a normal year. The good thing is I finished the marathon by running the whole distance. But it was not fast enough. After all I'm glad that I finished the race, my 25th IM finish! Last few months I had some ups and downs. After my stress fracture I started running again in the beginning of July. But after a few weeks the pain was back, so I had to stop running for again 3 weeks. This was not good with Challenge Almere-Amsterdam upcoming within only 7 weeks. In the meantime I did a lot of swimming and biking. So the last week of August I started running again, following an Olympic Distance race. This one went very well, I didn't have pain on my shins, so I decided to give Challenge-Almere a go! I knew that I did almost no run training during 4 months, but maybe it was possible to run a marathon on my stamina and experience. Last Saturday I stood on the startline of the first Challenge race in The Netherlands. The weather was stormy with a lot of rain. But no excuse, everyone had to deal with the same circumstances. So at 7:30 AM we were off. I had a good swim. I felt strong and was eager to go on the bike. Despite the rain, wind and cold, I enjoyed it. After 60 km I was already 2nd woman behind German Susan Blatt. The gap between her and me stayed about the same during the whole bike part. When I started the run, I knew it would be very hard. The first 5 km were kind of ok, but than I could feel that the bike took a lot of energy out of me. And with the lack of run training it was a mental fight. My legs didn't want to move anymore. I was still in 2nd place when I passed the half marathon point. At that moment I wanted to quit, but at the other hand I made the choice to start this race so I had to finish it as well. And so I did! It was a very slow marathon, exactly 4 hours and my slowest ever. But now I'm glad that I made it. Not the result that I wanted, 5th overall and 2nd in the Dutch Championships, but this race came too soon after my injury. My congratulations go to the winner Susan Blatt who had an amazing race, especially given the hard circumstances! Also to Dutch National Champion Irene Kinegem who ran an fantastic marathon. After my recovery week, I will start working on my running again. I hope that I can finish my season with a nice result. I will update you soon about my further plans. Pictures by: Sonja Jaarsveld (bike/finish). Unfortunately the injury I got just before IM Lanzarote was serious! I had a stress fracture in my shints and have run a marathon with it! I still can't believe that I didn't feel anything during the race. So the result was that I didn't do any running for 6 weeks. 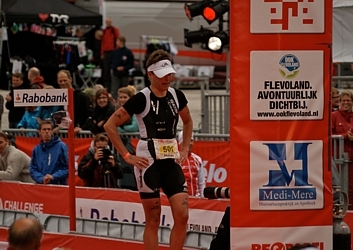 That means that I had to skip the half triathlon in Stein and will not start in Challenge Roth next week. Luckily I could do a relay with a friend of mine in Stein. I did the swim and bike and she did the run. So a little bit of fun and a good trainingday! In the meantime I started running again very carefully. I made new plans and want to be race fit the 14th of September during Challenge Almere. Next week I will have a short training/vacation in the area of the Mont Ventoux. I'm very curious if this mountain is really a killer! Stay tuned, I will let you know. 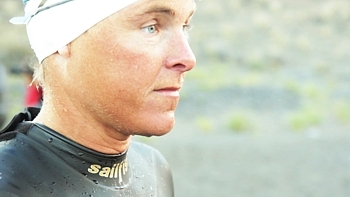 Last Saturday I was on the startline in IM Lanzarote for the fifth time in my career. I fell in love with this island where I made already a lot of training hours. The race is very special for me as well, despite of the fact that it is one of the most challenging races in the circuit. So far I finished three times and all of those finishes where on the podium: 1x second and 2x a third place. It was a great day. 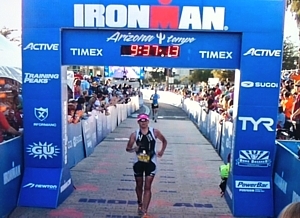 Finishing an Ironman always is a mental game, but the more you enjoy the race afterwards. The party went on when my good friend and Xendurance teammate Hanneke finished as agegrouper as 4th woman between the pros. And she qualified for Hawaii for the first time, well done! In my races I distinguish between A, B and C races. The races I did so far this year, were all C races: not important but meant to get some race rythm. 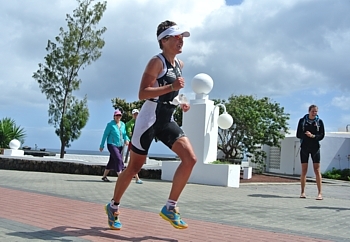 Yesterdays race, the half Challenge Fuerteventura, was a “B” race: not a peak race, but one where I started fully rested. After 4 weeks of hard training on Lanzarote, I deserved a rest week. A week ago I came with the ferry from Lanzarote to Fuerteventura, only a 15 minutes trip. I’m staying with friends (Xendurance team-mate Hanneke de Boer and her husband Rob) in a small town Gran Tarajal, close to the famous resort Las Playitas. I enjoyed the week and at the end I was ready to race. It was a beautiful day, yesterday. There was almost no wind, the temperature was perfect with 23 C and it was sunny. Before the race I gave myself three goals. I was not allowed to sport in my “comfort zone” all day, I wanted a faster overall time than last year (despite a 3 km longer bike course), and I wanted to finish top 5. The pro start was 5 minutes before the age groupers. For me that meant that if I was unlucky I had to swim by my own. And that was exactly what happened. At the start I got a little bit dizzy, so it took me some seconds to get relaxed again. And that was the moment I missed some feet. Well not really a problem, but that takes you a little bit more energy. Once I was on the bike I felt good. Not as strong as I felt in some races before, but good enough. I had a fourth overall bike time. The run was steady, also an overall fourth place. And I finished in fifth, faster than last year. So I reached my goals :-) Although the first one is hard to check. I know one thing, and that is that I’m more the athlete for the full distance! Now I have two easy days on Fuerte and then I will do three days with a lot of biking, since here I still have the chance to ride in the hills and wind in my preparation on May 18th, Ironman Lanzarote, which is an “A” race for me. I will leave the island and go home on Friday after 6 weeks Canarian islands! But I will be back in a little bit over 3 weeks! Do you know the feeling that you are mentally so tired from training that there is no drive left in the body to push the pedals? That you would like to throw your bike besides the road and lay down next to it? That you can’t imagine that you have to run 20 km? And the damn strong wind, please go away. I’m thinking I can not hold my bike anymore and I don’t have the time and the guts to drink! Well I had this feeling last weekend. My training schedule told me that I had to do a race after 70 hours of training in 2 weeks. 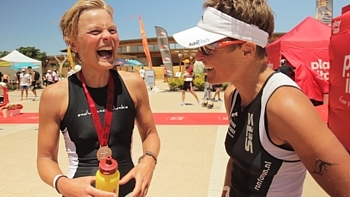 It was the Tri122 in Costa Teguise in Lanzarote: 2 km swim, 100km bike and 20 km run. It was meant to be a hard trainingsday! But I’m not sure if it was as hard as I was supposed to train. I didn’t have the spirit to push it really hard. I was just too tired. But recovery was fast, and the good thing about that was that I had a good trainingweek last week. I even did a training-ride with the double distance on the bike (210 Km) with almost the same power as during the race. That says it all :-) ! But I’m not complaining. I have the best job in the world. Staying six weeks at the Canarian Islands is a dream for a lot of people. I know that and I’m enjoying every minute of it. 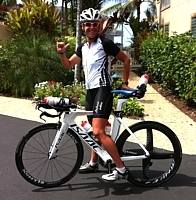 I’m doing this for one big goal on the 18th of May: Ironman Lanzarote. Living in villa Trisports where you are treated like a princess. Yesterday we did a swim video analysis and I learned again a lot from it. The only thing you have to do is follow your training schedule. Very simple. And in the meantime I trained already with amazing athletes which helped me to become stronger. I’m back on the island of Lanzarote. After a month of training at home, I took the plane last weekend to Lanzarote. Just in time, because last week the weather was horrible back home. With a 25 m pool in front of my appartment I'm enjoying training in shorts en T-shirt. The good company of Gonny and Danne is very nice as well. The days pass by very fast. For example, yesterday was nineties day. We started with a ninety minute run in the morning. After a good breakfast containing of yoghurt, muesli and a banana and of course the Xendurance we swam for ninety minutes. Also after this session we ate again, to have enough energy to finish the day with a 90 km bike ride, which included the beautiful Tabeyesco climb. 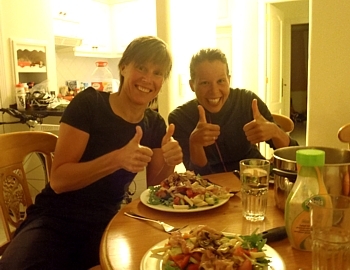 Tired but happy we enjoyed our self made pasta salad for dinner. After a good night of sleep we started today with an intensive swim session. In the afternoon we had a brick session with hard blocks on the bike. The legs were kind of flat but by motivating each other it was a very good session. The day ended with one hour run of the bike in a nice pace. Refueling myself with a bottle of Xecute will help me recover from those days! Lanzarote is a beautiful island and it makes you so strong! When you are reading this and you would like to train for a week with Easter on this island with me, don’t hesitate but book! I will be guiding you during a Pre-Ironman Camp from March 29th till April 5th and we will be staying in the beautiful villa of Trisports. At the moment the first month of 2013 has already past. Time to tell you about my plans for this new season. And they are great, even if I say it myself. I have three main goals this year: IM Lanzarote, Challenge Roth and Challenge Almere-Amsterdam. After the stomach problems I had in Lanzarote last year I want to make a revanche. I have had Challenge Roth already a lot of years on my wish list and it is one of the races with the most spectators along the sideline. I will certainly enjoy this race and hope to make it a fast one, as the course is known to be fast! And now the Holland Triathlon has changed into a Challenge race, I will certainly be there to defend my title. Besides these three full distance races, I will do also some “shorter” stuff. I will start my season in the Half Challenge on Fuerteventura. And of course I will be present during the half distance of Stein, my favorite race in the town I used to live for almost 10 years. Something new this year is that I will start in a team in the dutch “Eredivisie”, the major league of triathlon in The Netherlands. Our team consists of ladies who are competing mainly on the long distance. We would like to show that we are also able to sprint! It will be a great challenge, so watch us this year! At this moment I’m on Lanzarote for two and a half weeks and I’m working hard on my fitness. I’m riding my bike a lot and enjoy it every day. 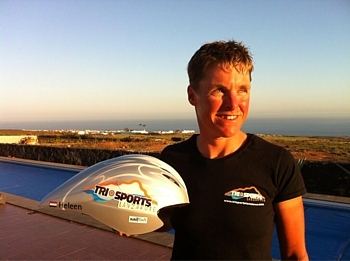 I’m staying at a fantastic location at Trisports Lanzarote. A beautiful villa with a 25 m pool. I would recommend it to everyone! The motto for this camp is "smash it!". And I think I will keep it for the whole year. DISCLAIMER www.heleenbijdevaate.nl: © Copyright by Heleen bij de Vaate & Rob de Hooge. All rights reserved on content of this website.